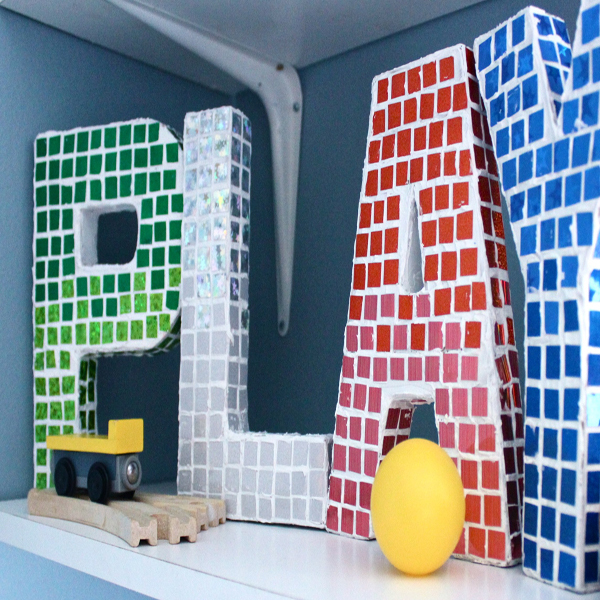 Project Description: Use Grafix Funky Film to create mosaic letters that look like tiled ceramic. They’re lightweight and easy to hang, and they won’t break! Note: Please note, this is a home decor project, and is not intended to be used as a toy. Keep out of reach of young children. Begin by cutting the film into strips, about a 1/2 inch wide. Then, cut the strips into squares. Spread the modeling paste on a small portion of the letter. You can use a putty knife or a plastic knife. Spread it so it’s just thick enough that you don’t see the paper beneath. It’s a lot like frosting a cake! Use the back side of the knife rather than the serrated edge to smooth the paste without leaving ridges. Add the film squares in a grid pattern. Work in small areas, as the modeling paste will begin to set after 10 minutes or so. Press the squares down so they are firmly embedded in the paste. Try not to get any of the paste on the surface of the squares. If you do, you can scrub it off with a wet wipe once it’s dry, but it will save you time if you keep them clean. I’ve decided to keep each letter monochromatic, using two patterns of film in the same shade for each. Grafix makes a whole line of pretty colors and patterns, so you’re sure to find something that will fit your space. Another option would be to cut your film into a variety of irregular shapes for a more eclectic look. You can also tint the modeling paste with a bit of acrylic paint if you’d like. Now that I’m halfway through with this letter, I’ll make two rows where I mix the two patterns. Then I’ll finish the bottom half with my second pattern. Don’t forget to fill in the holes with paste. Tile the sides as well. You can smooth out bumpy edges with a fingertip. 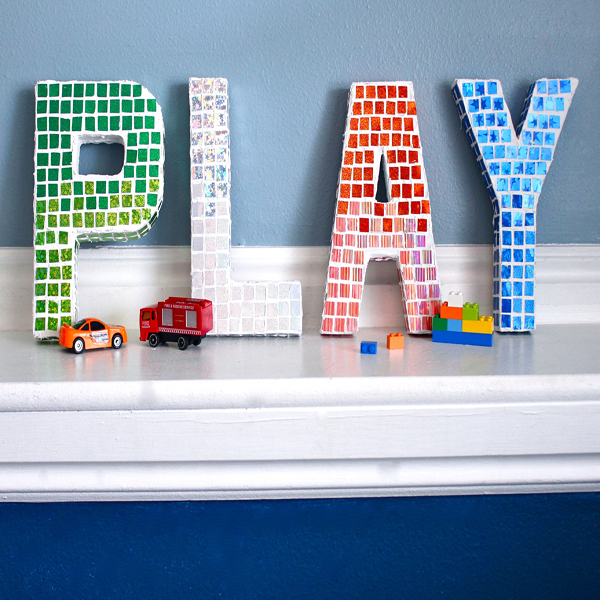 These letters look great on a bookshelf or mantle. They’re also easy to hang on a wall. I recommend using Command Damage-Free Hanging Strips.